Royal Slider is easy to use jQuery image gallery and content slider plugin with animated captions, responsive layout and touch support for mobile devices. As navigation you can use thumbnails, tabs or bullets. Use it as image slider, slideshow, HTML content slider, gallery, banner rotator, video gallery, carousel or even presentation. Developed in best practises of HTML5, CSS3 transitions are used for all animations (with fallback). Royal Slider is focused on performance, accessibility, stability and providing best experience for user with any device. It doesn’t have a dozen of fancy transition effects, but types that it has work as fast and as smooth as current day technology allows. Script modular architecture allows you to exclude the parts that you don’t need from the main JS file to optimize it even more. Plugin is used by top agencies and brands around the world, view list of real world usage examples on demo site. YouTube & Vimeo videos in slides. Deep-linking – link to specific slide from URL. Adjustable speed, transition and easing for each caption or slide. Static content for each slide is allowed. View demo with static content. Animated HTML captions with custom effects (fade, move top, move right…). All starter templates are responsive down to mobile. 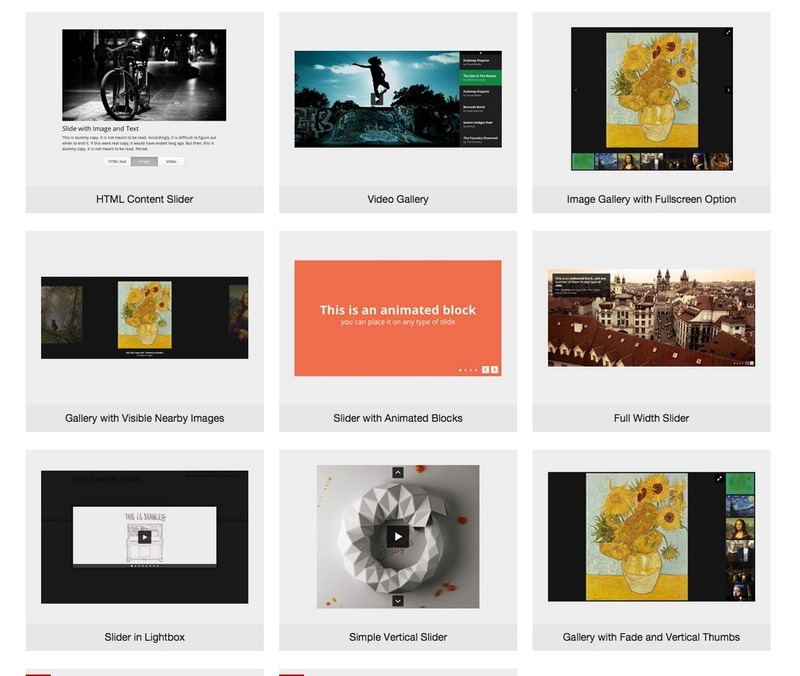 Thumbnails and slides can be dynamically resized.. Slides with a speed of swipe. Ability to remove drag navigation using mouse. SEO optimized and semantic, images are indexable, completely any tag names for markup, captions can use any tag you want (“h1”, “h2”, “p”...). Public methods, properties and callbacks (go to slide, play slideshow e.t.c.). Includes methods to dynamically add or remove slides. Set start slide index and spacing between slides. Slider can be put inside lightbox script, like Magnific Popup. 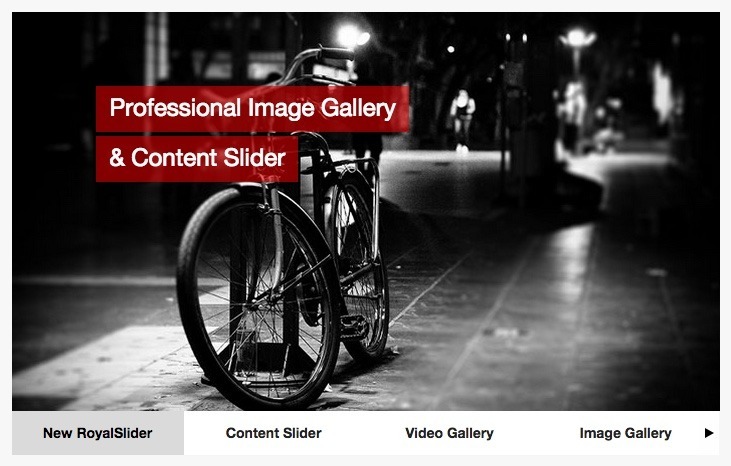 View slider in lightbox example. Can be easily loaded using ajax, has destroy() method. Customizable interface (add/remove arrows, bullets). Thumbnails, Tabs or bullets for navigation. Physics-based touch thumbnails image scroller that can be placed anywhere on page and container any HTML content inside. Thumbnails can be positioned vertically or horizontally and can be resized separately from slider. Multiple sliders allowed on one page. Custom scale mode for images – fit into area, fit into area only if image is smaller, fill area. Photoshop (.psd) files of skins included. Any HTML content can be placed inside slide. You may ask a question on support forum about implementation, note that support doesn’t include installation or customization service. All slider designs listed here are custom-designed and are copyrighted by their authors. List includes slideshows created both by HTML and WordPress version of Royal Slider. You can find more reviews from real buyers in comments page. Images in preview: notsogoodphotography, Gilderic Photography, Stuck in Customs & Wikipedia open image license. Images are not included in purchase.